Calling all local military families, friends...nominate today! LOWELL, MASS. 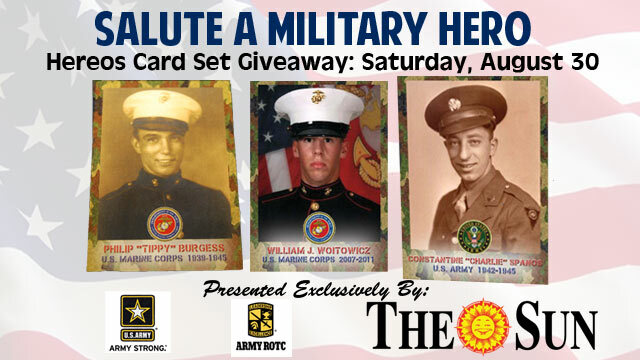 - The Lowell Spinners, Class-A affiliate of the Boston Red Sox, are once again looking for local military veterans and active duty soldiers to salute in their second edition "Military Hero Baseball Card Set," presented by Army ROTC and The Lowell Sun. 30 honorees will be selected to comprise the set, which will be given to the first 1,000 fans in attendance August 30. "We are thrilled to be able to continue what we hope is an annual tradition with this special baseball card set," said Spinners President and General Manager Tim Bawmann. "Last season's game was perhaps one of the most emotional nights at the ballpark of my baseball career, not just for the honorees, but for everyone in attendance. We can't wait to meet this year's honorees." Following the first edition of the set, given away during the 2013 season where the Spinners honored 34 local veterans and active duty servicemen and women, the promotion was so popular it was awarded a Minor League Baseball Golden Bobble Head for "Best In-Game Promotion." In addition, over 12 other organizations have implemented a similar promotion in their community this season. "When they say imitation is the best form of flattery, they were not lying," said Bawmann. "To have this promotion take off to the point where other communities are doing a similar theme to honor their local servicemen and women is so great to see." The non-traditional baseball card set will feature men and women from throughout the Merrimack Valley who have served our country. The 30 card set will be given away to the first 1,000 fans through the gate Saturday, August 30 with the families and heroes themselves in attendance. "As we learned last year, the hardest part of the process is whittling the set down to 30 honorees," said Bawmann. "There are so many heroes out there which is why we are so happy to have this as an annual promotion." The Spinners are calling on people throughout the Merrimack Valley to nominate their friends, family, co-workers and neighbors. Nominations can be made at www.lowellspinners.com/militaryhero now through Tuesday, August 12 and the "roster" will be released shortly thereafter. For more information on nominating a member of the community for the set, visit www.lowellspinners.com or www.lowellspinners.com/militaryhero.